I've been collecting goodies for you from across the Internet. I recommend fixing a nice cup of tea. Making yourself comfortable. And giving yourself time to sip, savor and immerse yourself in the goodies waiting for you. Or feel free to jump in and go through them as fast as you can. Melody Fletcher goes pretty deep into advanced manifesting concepts with her article, Does anything actually exist? Have you ever wanted to manifest something, but found it hard to begin because it's something you've never experienced before? Maybe you want to be in a relationship, but you've never been in one and you aren't sure how to visualize being in one… or maybe you want a million dollar check, but you're having trouble imagining such a check… This article covers manifesting the unknown. Often, we use the Law of Attraction for simple things, like a new job, meeting a specific person, or finding a parking space. But sometimes we want to go deeper. We don't want to create just a new future, we want to create a different past. Cynthia Sue Larson gives you guidance for changing the past here. Want to apply the law of attraction to your business? Get some great tips here. Sometimes it's a challenge to say, “YES,” to our desires. Limiting beliefs, resistance, and other little (or big) things can crop up to prevent the things we want from manifesting. We have to learn to say YES to opportunities with power and joy. This button might help. 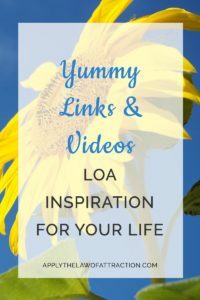 And now for some gorgeous, uplifting videos to get your manifesting juices flowing! I’d love to hire Elizabeth! lol Seriously, a visualization is a visualization. I’d like to ask you some advice about how to use your methods for a specific goal, as mine is to become a permanent resident of the U.S., and possibly get the citizenship long term (I’m from Europe), as for now I have nothing which favors me as a candidate for immigration (no diploma, no potential employer willing to support a worker visa application as for example) and really don’t want to find a citizen to marry as I don’t want to make it depend on a relationship. I browsed many of your articles, I’ve read on one of them that self-love can improve your career as well, it can be an interesting track but I’m still in the blur about tools to manifest this. People from my native country hold a very discouraging speech about this as if were something impossible and it’s tough sometimes to hold on, find my way to my goal. I did many research, even got immigration lawyers advice, applied for positions there, met awesome potential employers but my absence of worker visa stood in the way as a road block, and it still seems tough to find my door to open. I feel isolated in my native country I never felt as mine, whereas I feel home in America where I have awesome friends. Which tools can I use in particular to manifest my goal without it to take decades? Is there one of your 3 books which can help me more in my path to my aim? I know you know nothing is impossible, yet I’d be thankful for your help. I think any of her books would work. I like the love one best. Her money one covers jobs.